Many astronomer hate when the clouds come in and interfere with our observations, but just looking up at the sky during the daytime can yield some interesting observations. We will talk about that in a minute and then we will discuss the wonderful star Mira and this lazy astronomers new approach to making quick observations of impossible to see in city lights and hard to find objects. While out and about, escorting Astronomer Assistants Danny and Ruby, I noticed this view and image of some visible aircraft contrails. 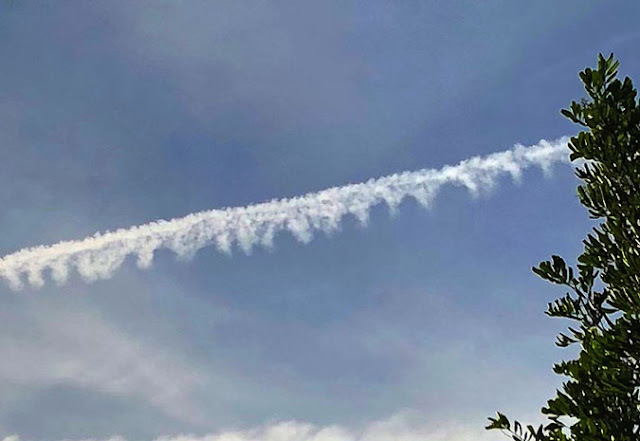 I wondered why the contrails didn't just evaporate away and instead developed these individual globs or lobes along the length of the contrail. What was going on? At the monthly OCA meeting, the What's up Speaker, OCA and Griffiths Observatory Astronomer, Chris Butler, mentioned the wonderful star system, Mira. Mira is located in the constellation, Cetus, The Whale. Following astronomical star naming convention, Mira is identified as o Cet, for Omacron Cetus. I was so excited about Mira also, that I planned to make one of my own observations of the star. Thanks for generating the excitement, Chris! Mira is currently understood to consist of a large red giant, designated Mira A, and a white dwarf, designated Mira B. 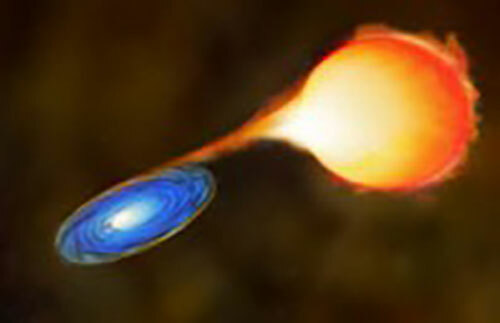 Gas is being stripped from the red giant and flowing to the white dwarf and creating an enhanced accretion disk there. See the artist's concept image below. Most of us are not going to be able to resolve the binary system, but we all can make a photometric measurement of the light curve for Mira. 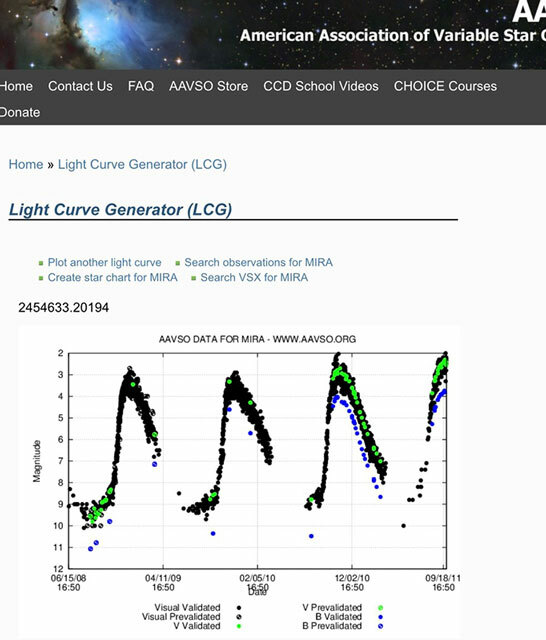 A search of the AAVSO variable star database shows this plot of some previous measurements of the light from Mira. Light curve observation of Mira shows its wide magnitude change with a period of around one year. The observed magnitude varies between something like between dim 10 and quite bright 2. 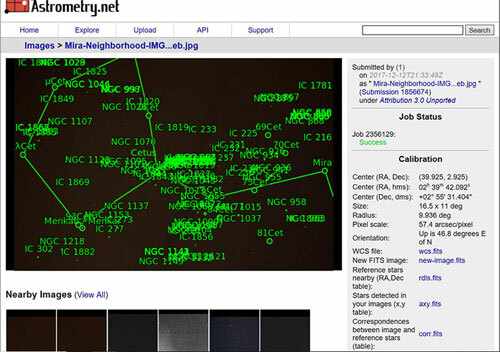 While it is harder to get high resolution optical images the use of long baseline radio astronomy can get resolved images down to the milli-arcsecond range. The ALMA images below show the relative distances between Mira A and Mira B and also a bright glob of gas around the red giant. So, wow, Mira is quite wonderful and is the first of many prototypical star systems that exhibit much the same behavior. observations, I felt even lazier and elected to just take out the camera tripod. The issue here then is how to find Mira when there are not a lot of visible stars nearby. Of course, if I wheeled out my tracking goto mount and did all the setup and alignment, I would be good to go, but that takes more work than I wanted to assign to this one simple light curve measurement data point. (8) Take the image and hope for the best. The observation time for Fomalhaut was selected for 6:00 PM and predicted locations were Az = 189 and Alt = 26. The observation time for Mira was selected to be 5 minutes later when Az = 126 and Alt = 38. The difference between these two pointing locations is -63 degrees in Azimuth and + 12 degrees in Altitude. We are now ready to make the observation when the sun goes down. The image below shows the various setting circles on the camera tripod head. 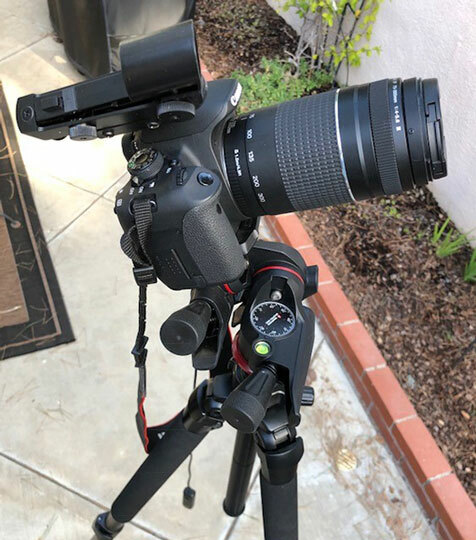 A key thing to remember to do when using this method is to level the tripod, using the installed bubble levels, when the tripod has been setup in the selected observing location, which is chosen so that both reference star and target star are visible. Al I have to do is note what the azimuth and altitude indicators show for the starting location, here to be Fomalhaut, and then turn the knobs to adjust for the relative differential change in position for where Mira will be in 5 minutes. 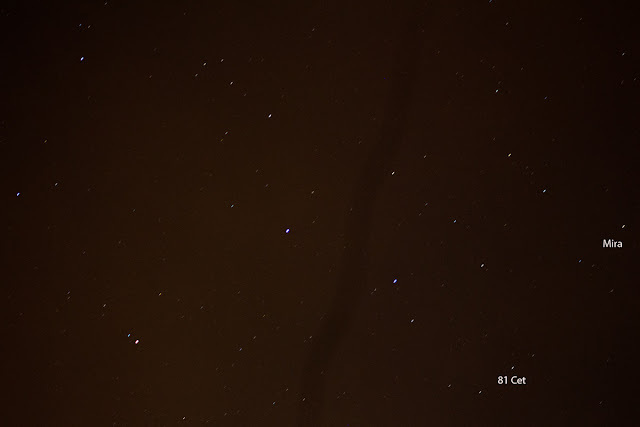 The 15-second exposure had several visible stars, even though hardly any were naked eye visible so in order to tell if Mira was in the camera frame of view, the image was uploaded to Astrometry.net and hey, luckily, Mira was just barely inside. I guess my change to the azimuth and altitude settings was off a bit but still just enough to capture the target star. 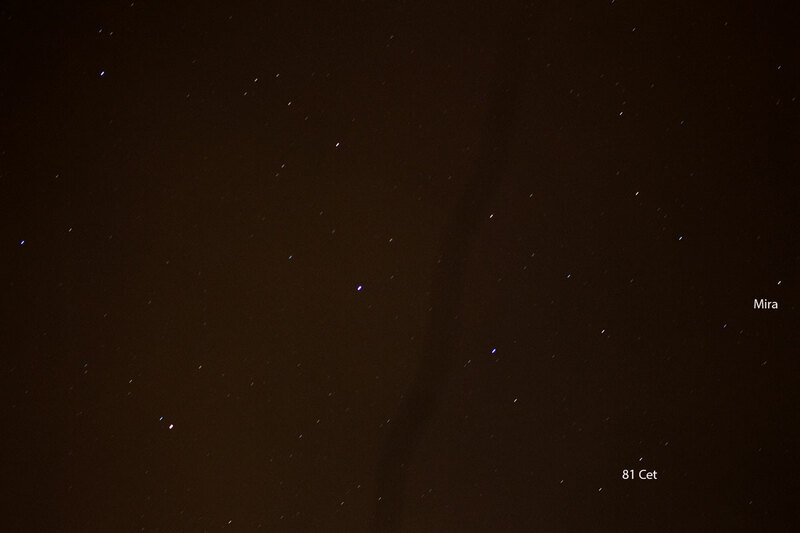 Below is the DSLR image, 15 second exposure, 75 mm lens, with annotated locations of Mira and a known star, 81 Cet, that will serve as the photometric reference star. We can now use measurements of the total light received from the reference star and Mira in order to calculate our estimate of the visual magnitude of variable Mira at this observation time. by 2.5 * log (357,170 / 192,643 ) = 0.67. So the estimated magnitude of Mira is 5.65 - 0.67 = 4.98. We should not interpret the two significant digits in the estimate to actually be significant to two decimal places because of all the other correction factors that need to be applied to magnitude measurements. For instance this estimate does not include corrections for light extinction due to altitude, even though in this case the altitudes of the two stars are both within a couple of degrees, and the vignetting effects, but luckily in this case, both stars are located near the edges of the image. So, this has been a wonderful review and first attempt at imaging the wonderful binary star, Mira, which has been observed by other astronomers for over 400 years now. It is known now that the two stars in the binary system are about 70 AU apart, which from our perspective is about 0.6 arc seconds and the pair is located about 92 pc or about 302 light years away from us. 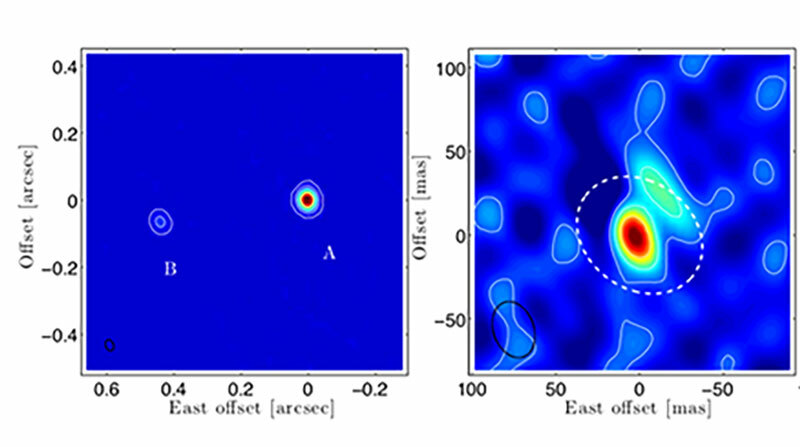 It is so neat to see that with new radio observatories, like ALMA, we can resolve these two stars down to the milli-arc second and begin to see the workings of the binary star accretion disk and bright spots and hot gas blobs around the red giant. One lesson learned during this trial observation was to always plan for known rotation of the stars during your site selection. The location I picked was initially fine, but since I had got setup about 15 minutes before the first observation of Fomalhaut, by the time the final observation and centering of the star at 6:00 PM came around, the star was just dipping into a nearby palm tree and would have been obscured if I had to wait another 5 minutes. I also fooled myself into believing that everything was going to be ok because I could see the star from my eyelevel, but when I dropped down to camera optical axis level, there was hardly any margin left. 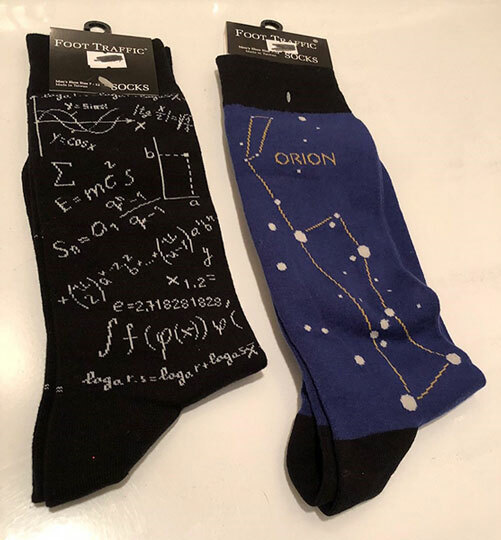 Finally, I received an anniversary gift from Resident Astronomer Peggy, who I assume was in cahoots with OCA and Hughes Lab Manager, Becky, both of which were shopping in Julian, and found some socks that could be useful to the budding physicist wannabe, especially as a crib sheet for the dreaded physics class quiz or exam.